SEAFOODplus has been selected by the EU to exhibit during a major conference in Prague 7-8 May 2009 and will use this opportunity to welcome new members from Central and East European countries. Thursday 26 March 2009 the new SEAFOODplus research platform was officially launched in Brussels. The event was celebrated with a champagne reception. 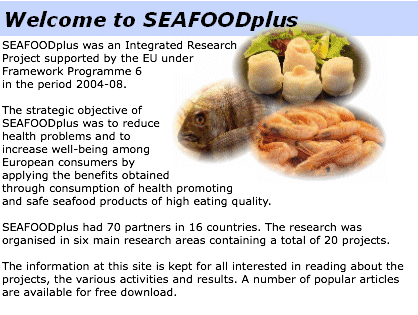 A new SEAFOODplus research platform is being launched and 20 members have already signed up. You may also apply and join the launching event in Brussels 26 March. This study investigates differences in motivations for fish consumption and fish consumption behaviour between people from households with or without medical history of cardiovascular disease, using data obtained from the SEAFOODplus pan-European consumer survey in five EU countries. The poster illustrates how integration has been obtained successfully within SEAFOODplus and how links have been created to the outside world. A number of articles published in the EUROFISH magazine explains in simple terms the contents of SEAFOODplus. All articles can be downloaded.